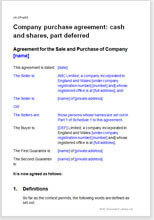 This is a comprehensive agreement for the sale of a single company for cash and equity (shares) in the acquirer. Additionally, there is optional provision for an additional amount to make up the whole purchase price if the warranted future profit is met. The bulk of the document comprises the warranties. How these work and why they are so beneficial is explained in detail here. To summarise, the seller warrants that there is no undisclosed information that if known might reduce the value (for example, that there are no materially large contingent liabilities in supplier contracts). If the warranty turns out to be false, the buyer has recourse to seek damages. This document complies with the Companies Act 2006 as amended. If what is being bought are the assets of the business or a distinct stream, then a sale agreement should be used. Since the deal is partly for the equity in the buyer’s company, the seller may be subject to provisions in any shareholders’ agreement as soon as the transaction is completed. The seller should therefore enter into a new shareholders’ agreement at the same time as the deal for the acquisition completes. We offer a number of templates for shareholders agreements that would be suitable.